I may not be somewhat good in writing but you should see how much I have improved and that is the basis of this entry. 500 words constriction so let's go! Dean killed Hitler so all those grammar Nazis, beware. Actually, having words constriction is also a good way to improve your writing. It helps me to focus on important things and makes me try to explain in concise vocabulary. 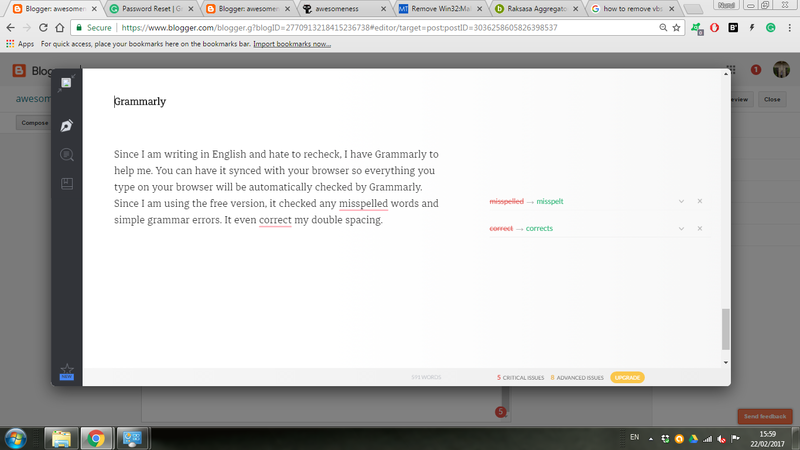 I've tried some apps to check my spellings and grammar errors and Grammarly has worked out so good. It's now my go-to since it allows online checking. Yeah, it checks while we write, it's magic. 3. Use bold and italic option wisely. When I write there are certain words I need to emphasise properly so that the readers gets the vibes that I want to deliver. I would use the bold and italic option for that - ie bold statement has to be bold lah kan. Use ctrl+i to italicise and ctrl+b to bold so that you can write faster. 4. Never mix with other languages. I used to be hard on myself that strictly no Bahasa is allowed at all. It's actually not a good thing to mix. However, I still do it because it kinda feels more like me. But only a little bit like for example at #2 where I use the word lah kan because I liked how it is all in English and that there is this one word in Bahasa like, is this some cool words or anything? However, NEVER does it until the reader become lost. I saw some blogger write one sentence in English and the next sentence in Bahasa like some sort of alternating games. Worse, alternating paragraph. 5. Read more and some more. Although I am writing in English, Bahasa books would also benefit me. I love noticing the writing style and how the writer explained a particular moment. Reading helps to understand how we can explain stuff and adds up vocabulary. It triggers you to think and at the same time inspire. 6. Blog more and some more. Having a blog is also a meant for me to write better. Practice makes perfect, right? Publishing my works has given me some sense of accomplishment and kept me want to write more. Since I have lots on my mind, I write some variable topics and that has led me to learn many more new vocabulary and also challenge me to inquire new things. Not only that, I tend to read my posts for a few times and it allows me to assess what I have done wrong or which part I can do better. Honestly speaking, trying to channel emotions into poetry has also help me write better. Poetry is like the beautiful scenery at sunset but in words. Now, I can't have everyone write poems now do I. Just read some. I know a blogger who recently published a free poetry ebook if you want to try. Or you can simply read the lyrics to the songs that you like. Or you can try read my poems. Hi! Thank you for the book shout out. Really appreciate it! What better ways to improve writing except to write more, right? Agree with all your ways, and shud get my self a grammarly! Awwww. Thanks for agreeing with me. 2. I always just search for certain words meaning and grammar on Google. Will try use Grammarly next time I write! 3. Didn't know about the shortcut to italic and bold writing, thanks for the tips! 4. The sub title got me for a second there hehe. I totally agree with you that 'writing in English and Bahasa like some sort of alternating game (sentences/paragraph)' is a big No. Totally turned me off to continue reading the post. 5. Most of my inspiration to write a post, also improving my writing skills is by reading. Nothing could beat that. 7. I love your poems! Yes, those alternating things also a turn off for me and thanks for the love! I always worry about my grammar and vocabulary. And guess how I checked my writing? I would google the phrase that I'm unsure about bit by bit. It's such a hassle. So thanks for mentioning Grammarly! I used to that also! It's so good to have Grammarly now and your welcome. I love the way you write and explain things. It's very comprehensive and detailed. I'm that kind of blogger who tend to mix any languages as much as I can hahaha. Idk why but some words are better to write it English, so that's how it turned out to be. Thanks for the nice comments on my writing, I really appreciates it! I understand how you can feel that way because I used to but after some time I start to understand the greater importance of using only one language. So maybe someday you'll feel loyally comfortable to set on one language only.